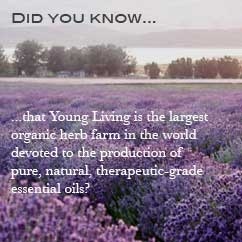 ﻿ Essential oils, are the natural, aromatic volatile liquids found in shrubs, flowers, trees, roots, bushes, and seeds. The distinctive components in essential oils defend plants against insects, environmental conditions, and disease. They are also vital for a plant to grow, live, evolve, and adapt to its surroundings. Essential oils are extracted from ﻿aromatic plant sources via steam distillation, and are highly concentrated and far more potent than dry herbs. Young Living has always been at the forefront of bringing this ancient tradition to modern users, introducing millions to a total mind/body wellness they may never have dreamed possible. Primarily extracted through careful steam distillation, but also through cold pressing, the purest essential oils are far more powerful and effective than dry herbs, delivering quick and effective results. Any time you hold a bottle of our powerful essential oils, you are holding the pure essence of health-promoting botanicals that can be diffused, inhaled, applied topically, or incorporated into massage.